This was a really good game. I don't know how else to put it. After a very soggy tailgate and a 75 minute delay to start the game, the clouds parted and the sun came out for just long enough to play complete rain-free game. After a sorta slow start...scoring-wise...Michigan's talent and ability eventually showed up on the scoreboard as they pulled away from an upstart Maryland team. This was never a game, despite the closer than it should be score in the first half. Michigan moved the ball very well on the ground and through the air. The defense was a typical Don Brown defense. Maryland had only 42 yards of offense through the 1st half while Michigan had 291. The second half was more of the first...but with more Michigan scoring and oddly, less offensive output. What really helped Michigan in the second half was numerous Maryland penalties, especially on defense, that helped Michigan move the ball. Maryland is one of the nations most penalized teams (even more than Michigan). Michigan's average starting field position in the second half was also much better thanks to a stifling defense and more Maryland punts. This was the last game on Michigan's schedule before the real fun begins. Next week Michigan hosts Wisconsin under the lights, the week after they head to East Lansing for presumably another night game, and then a bye week before returning home to take on Penn State. There's no doubt any hope for a Big Ten title requires Michigan to be at their best for these next three games. 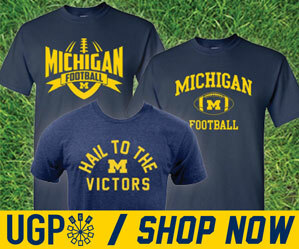 With Ohio State rolling and Penn State with only one B1G loss, Michigan can't afford to drop any of these next 3 games. That's why cruising past teams like Maryland, with minimal injuries, is so important. It looks like Michael Dwunfour could see some extended time out with what seems like an achilles injury. Michigan also had a few players not in uniform yesterday that they hope to get back in the next few weeks...Rashan Gary (shoulder/arm), Tarik Black (ankle) and Chris Evans (leg). In a game like this, the best of the game can really be anything. The offensive line played very well, Shea Patterson had some very nice plays enroute to his best game, statistically, as a Wolverine. Karan Higdon had his 4th straight 100+ yard game, Zach Gentry played well. The defense was, well a typically Don Brown Michigan defense. So with all that said, my best of the game was the Jared Wangler touchdown catch followed by a Ben Mason two-point conversion. 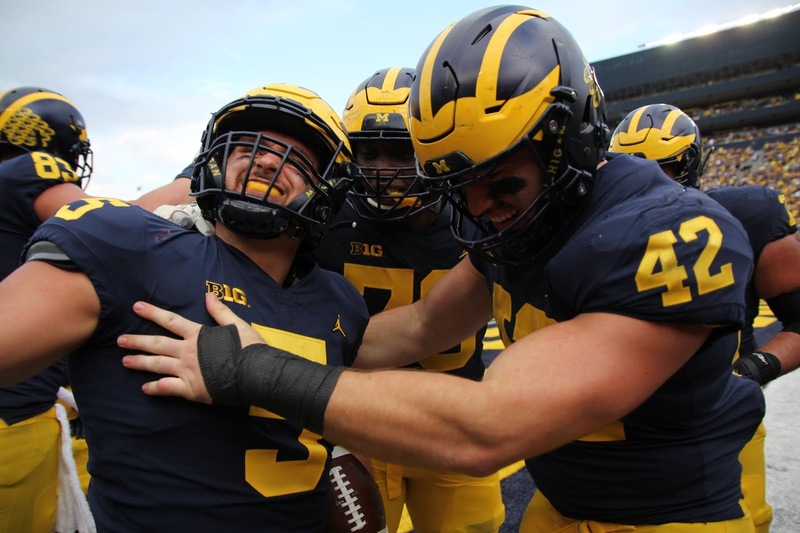 There's no question the fullback position is a huge part of Michigan's offense and that back-to-back play combination was a prime example of the run-first pro-style offense that Jim Harbaugh is continuing to build in Ann Arbor. I feel like I'm being really nit-picky here, and a little snobby, but Maryland killed what was statistically a terrific game by Michigan's defense with a frustratingly good 4th quarter. On one hand, hats off to the Terrapins for not giving up...but it was clear that the game was well in hand and Michigan had dominated both sides of the ball. Maryland tallied 133 of their 220 total yards of offense in the 4Q alone...including 101 rushing yards. Four of their five 3rd down conversions took place in the 4Q. That, plus 14 garbage points muddied up what was really a dominating Michigan performance. The play that occurred at about the 5:15 mark of the 3Q...the Higdon catch and run for a touchdown that was called back due to a block in the back by DPJ was an odd play from the penalty enforcement standpoint. The DPJ block in the back was certainly the right call. And the targeting call on Tre Watson was also the correct call. What was odd was how the penalties were enforced. The result of the play was a touchdown, the block in the back occurred at the 12 yardline. That alone was a 10-yard penalty from the spot of the foul to give Michigan a first and 10 at the 22. The targeting call offset the block in the back...so by rule, they cancel each other out and the ball was sent back to the original line of scrimmage at the 42 yardline. Had Harbaugh declined the targeting call, Michigan would've gained 20 yards of field position (and the Maryland player would've still been ejected). But since the penalties offset, the play is run again. I don't know if this is a correct interpretation of the rule, but it definitely seemed odd to me at the time and even odder a day later. No position group has improved more week to week than the offensive line. And no position group needed to improve more than the offensive line. We've heard all fall from OL coach Ed Warriner about how well this group has come together and grown together. We're starting to see that on the field now. Maryland is not Ohio State, but they're no slouch either. I thought the line played exceptionally well. Michigan ran the ball 40 times for 171 yards...not huge numbers, but you could see the line get a good push especially in short yardage situations. Plus, almost every run was between the tackles. Pass protection was also great, Patterson was hurried a couple times, but he was never sacked...I think that's the first game Michigan hasn't given up a sack. Finished the game with 5 tackles, 2 tackles for loss and 1 sack...although he was clearly involved in 2 sacks in the 1Q...so I'm not sure why he wasn't credited for both of them. This was the first game in 3 weeks where Hudson was on the field for the entire game. His presence was felt all day. Lately is seems this ball is reserved for punter Will Hart. But Hart only punted once yesterday...on Michigan's first drive of the game. Quinn Nordin put a couple of kicks through the uprights from 34 and 31 yards out to give Michigan some points when drives stalled. See offensive game ball above.